About a year ago, I had the opportunity to help declutter and organize someone else’s closet for the first times. And it was not just one, but a couple’s closet! Here’s how it went. I remembered attending a KonMari workshop last year when I received a message from my friend, Ginger Arboleda asking if I can teach her about KonMari. She bought the book but hasn’t had the time to read it. I gladly said yes, and the next thing I know, she was recording our decluttering project in FB live! 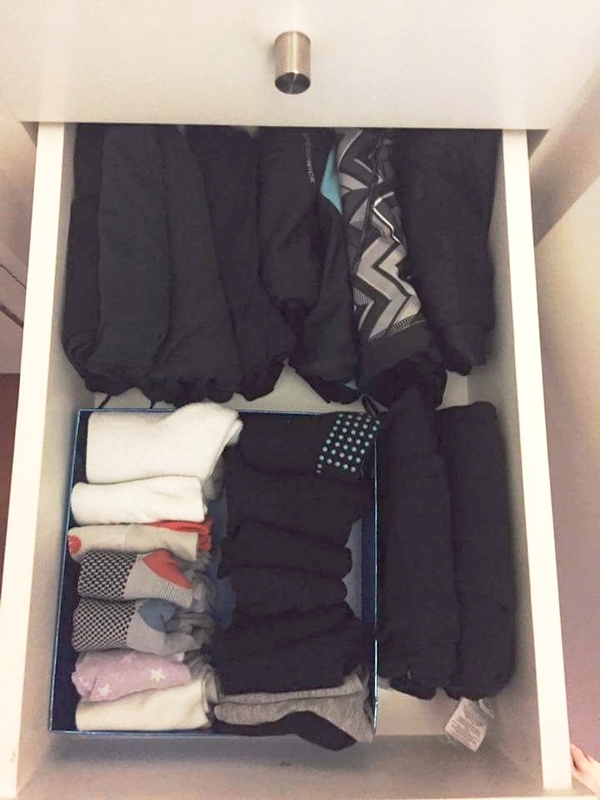 So I spent the morning sharing with Ginger and her husband, EJ (who is my former boss and a good friend) the basic principles of the KonMari Method, and showing them how to fold clothes. Ginger also asked her helper to join us as well. Yaya was so enthusiastic to learn! After lunch, we started to put into action what we’ve discussed. 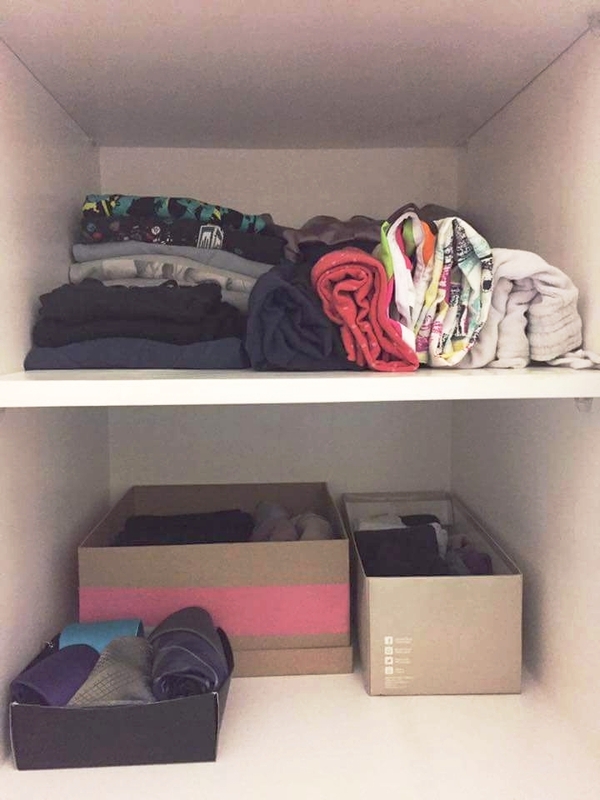 As Ginger and EJ share the same closet for their clothes, and they’re both at home at that time, we decided to declutter both of their clothes at the same time! Talk about being efficient! People who know EJ and Ginger would agree with me when I say that they are a couple who’s always on the go, managing their businesses, and organizing events to support start-up entrepreneurs and freelancers. All these on top of spending quality time with their sassy little daughter, Zeeka! Ultimately, our goal is to simplify their lives and create a space where they can feel relaxed and calm when they’re about to start their busy day. 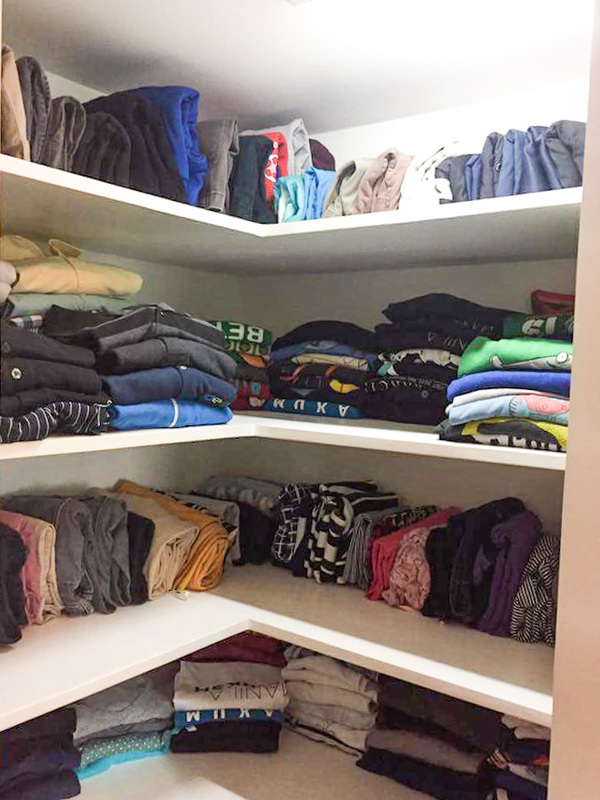 Their current 4-shelf closet unit plus the volume of accumulated clothes over the years made it hard for them to find and get the clothing they want to wear in the morning, especially those placed at the back of the shelves. We started out by emptying out all the clothing and created a mountain of clothes on the bed. This is the most overwhelming and effective part of the process, to see the volume of what you have accumulated. By category, I asked them to pick out a few of their favorite clothing items just to warm up their sensitivity to joy. Afterwards, they went through each single clothing item and decided which ones they like to keep, and which ones need to go. The decision making process is entirely theirs, and I was just there providing guidance and additional support. They started off quite smoothly, picking up one item after another, and placing them in the keep vs. discard boxes without hesitation. I realized that decluttering could be a fun bonding activity for couples too! I was amused at how they made the dreaded “discarding process” fun and light. They happily brought up memories of clothes they once wore to a special event or date night. They even made fun of themselves on why they even have a certain shirt they now find “baduy” (off-fashion). This helped them recognize the purpose that each item fulfilled, allowing them to discard these items with a grateful heart. The only stumbling block they faced was discarding clothing items given to them as gifts by friends or family members. This is when I had to remind them that gifts are gestures of the giver’s appreciation for us. It is a vehicle and nothing more. Once we’ve gratefully received the gift and felt valued and loved, we’ve fulfilled and honored their intention. When we change our mindset about gift giving, then we free ourselves from guilt and feeling burdened by something that do not add value to our lives. After 5 productive hours, we were able to sort and fold the remaining clothing items and assign a space for everything. SORTING and FOLDING - Yaya's face says it all! Ginger and EJ were able to discard 2 overflowing balik-bayan boxes of clothing that do not spark joy to them anymore. They decided to pass the joy to other people by giving some to their helper and guards, while the rest were donated to Goodwill Industries of the Philippines. This Facebook live we took after a week summed up Ginger’s insights and experience from our decluttering session. For her, decluttering was more than disposing of unwanted stuff. Letting go of the clothes she once loved gave her the space and opportunity to give joy to others. And for me, seeing this joy from her led me to realize how passionate I am in helping and witnessing other people live a better and more joyful life. Finally, here are the AFTER photos of our decluttering and organization session! Hanging clothes now have room for Zeeka!